If you missed it, here was my assessment of the Backs, WRs and TEs. The offensive line has started off pretty shaky with way too many penalties and mental errors. Not too many people have heard about offensive face masks until they saw two of them in one game against Cal. Cal is one of the worst in the conference and in the nation in terms of penalties against, and a huge chunk of that come from the offensive line. Issues like shotgun snaps from C Dominic Galas really hurt Cal from getting offensive drives going. After four games, Cal has rushed 120 yards less than after four games last season even though the backs have carried the ball about the same number of times (though having Shane Vereen probably helped a lot). Cal’s offensive line has allowed 6 sacks, which ranks fifth in the Pac-12. However, the offensive line has been stout at times, giving Zach enough time to make big passes especially during the game against Washington. There are still major issues with blocking and finding the right assignments, which was the main reason why Cal couldn’t score against Washington on the final few plays. Coach M will have a lot of work to do as much more ferocious defensive fronts will be attacking the offensive line. If Zach can have just a second more to find Keenan Or Marvin on pass plays, opposing defenses will have a very hard time defending against Cal’s pass plays. Isi Sofele always follow where the hole is supposed to be, so if the offensive line can block their assignments, Isi will have major runs up the opposing team’s defense instead of getting smacked two yards behind the line of scrimmage. The biggest hurdle for the offensive line will be getting over their own mental mistakes. Penalties on offense, kill offensive drives and momentum. 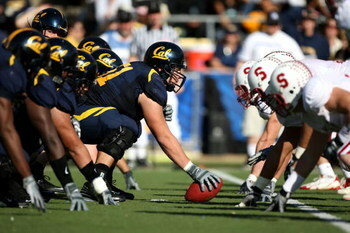 If Cal is to compete for the top of the Pac-12 North, the offensive line needs to stop making penalties immediately. Coach M has worked magic before, so let’s see if he can do it again.